Join the Local First Arizona Foundation for this locally-curated WeekendZona experience in Ajo! Photo courtesy of local Ajo photographer, Bill Perry. Through collaboration with local residents, we are able to craft authentically-vetted experiences that showcase the vibrancy of our rural communities. Join us and a group of fellow trip-goers as we discover hidden gems, embark on breathtaking adventures, and enjoy the locally-vetted experiences often overlooked by typical tourists. Not only does WeekendZona provide an opportunity to experience a one-of-a-kind, guided vacation, the program also aims to redirect the billions of dollars (6 billion in Southern California, alone!) that Arizonans spend vacationing out-of-state each year back into our unique and diverse small towns. Imagine the economic impact of shifting even a fraction of those funds back into our rural communities. These WeekendZona trips create measurable economic impact that help contribute to the prosperity of our small towns long after we leave. Join us in Ajo on March 8-10 for a guided experience uncovering the best kept secrets of the Sonoran Desert. Enjoy your stay at the Sonoran Desert Inn, a refreshing alternative to chain hotels, housed in a beautifully restored school. The inn is a short walk to the historic Ajo plaza and minutes from millions of acres of pristine desert landscapes. From picnic lunches at the Organ Pipe Cactus National Monument to native stories told around a fire with a glass of wine in hand, this trip is sure to ignite your love for Ajo. All packages will include lodging for two nights, meals, and group activities. See itinerary below. Single and double packages available. Pick up your ticket today to secure your spot! After registration is complete, we will contact you with lodging details. If you have any specific disability requirements regarding your lodging, or any dietary restrictions, please let the organizer know ASAP at liza@localfirstaz.com. 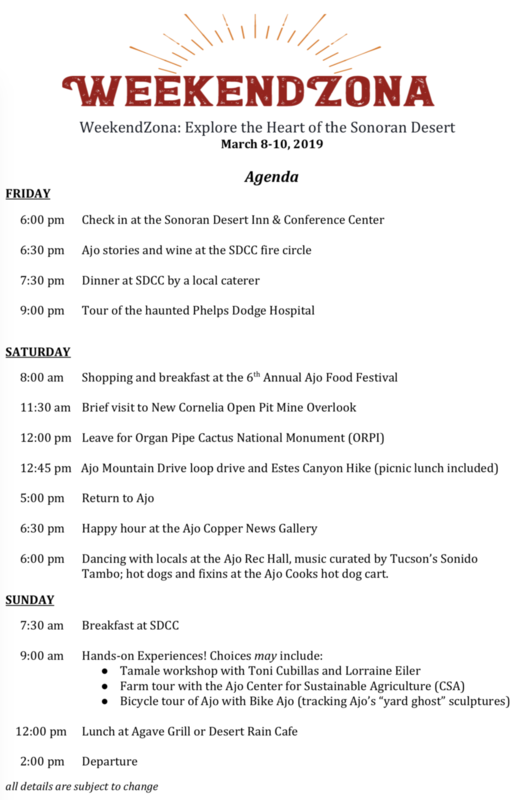 Lodging (two nights at the Sonoran Desert Inn), meals (Friday night dinner; Saturday breakfast ($10 voucher), picnic lunch, and dinner; Sunday breakfast and lunch), and group activities (Haunted Hospital Tour, Ajo Food Festival, Organ Pipe Cactus Entrance Fee, Ajo Dance, Campfire Stories, Tamale Workshop, Farm Tour, Bicycle Tour) are all included in the price of your ticket. Transportation, gratuity, and drinks are not included in the price of your ticket. You can contact the organizer at liza@localfirstaz.com. You can receive up to 75% refund if canceled by February 14, 2019. You can receive up to 50% refund if canceled by February 24, 2019. You can receive up to 25% if you cancel by March 1, 2019. You will receive no refund if canceled after March , 2019.